Legs feeling a little rubbery after running 26.2 miles? Sore in all the wrong spots? Go for a massage. Not to say that the Chicago Marathon finisher's gear isn't cool (I'm sure this year's Nike stuff will be awesome--it always is), but a massage is the best post-race treat you could give your body, except for maybe that beer we like to imbibe at the finish line. 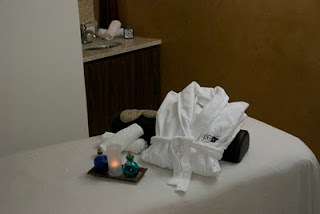 Based on recent research, 10 minutes of a Swedish massage can reduce inflammation in the muscles. And after all the pavement pounding you'll be doing during the marathon, it seems like an hour with a massage therapist's touch would be more worthwhile than another T-shirt, especially if your drawers are as stuffed as mine. I'm already remembering how stiff I usually am after a tough race--I practically fall out of bed Monday morning--and how my calves could use some kneading. Here's even more reason to get massaged post-race: The Spa @ Equinox is offering 15 percent off all of its massage services to Chicago Marathon runners. Runners can take advantage of this offer by bringing their marathon bib to the Equinox at 900 N. Michigan between October 8 and 14. This deal gets more and more enticing for this girl, who hates to pay full-price on anything, especially since I missed out last year (what was I thinking?!). If you need me after the marathon, chances are I've fallen asleep on the massage table--and based on how I currently feel, that time can't come soon enough. Have you gotten a massage after a race? Did it make you feel better?